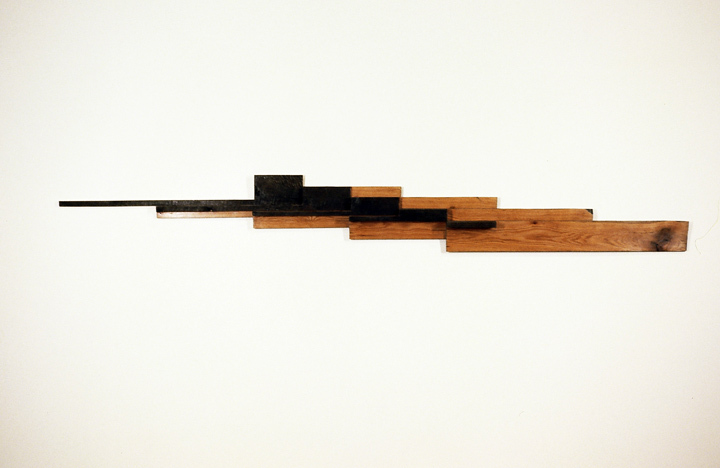 This piece explores three dimensional “filleting” of an original 6”x54”x3” oak plank into five parts and the reorganization into an extended unit. A solid plank was cut in such a way to preserve the original weathered surface upon each part. Cutting through this surface revealed unoxydized fresh new wood which offset the weathering. In the reorganization, only some sawdust was lost. The “fillets” were stacked in reverse order so that the wood grain would appear fairly continuous and the cutout shapes could visually be imaged in their original position within the plank. I wanted the viewer to reconstruct the plank visually based on the evidence before him.